Solotech completes world’s first permanent installation of new loudspeakers for hotel & casino resort in Windsor, Ontario. The Colosseum at Caesars Windsor Hotel & Casino resort. 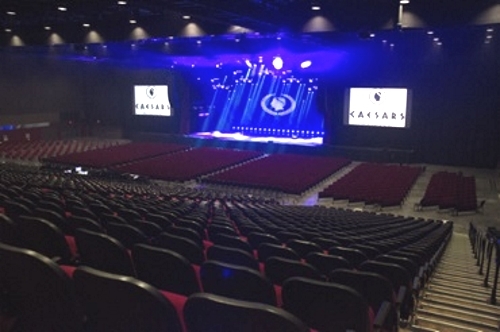 Audio-system integrator Solotech recently completed the world’s first permanent installation of JBL by Harman VTX A12 loudspeakers at The Colosseum at Caesars Windsor Hotel & Casino resort. The Colosseum is a 5,000-seat venue that hosts a wide range of performances—from rock bands to comedians. In order to improve the sound quality in the venue, The Colosseum hired Solotech to replace its entire audio system in three separate phases. In the first phase, which was completed earlier this year, Solotech replaced the venue’s aging main hangs with 26 VTX A12 loudspeakers, which represent JBL’s next generation of line array technology. Once all three phases of the upgrade are complete in April 2019, the system will feature ten additional A12 loudspeakers as out fills, four VTX V20 loudspeakers as center fills, six VTX V20 loudspeakers as side fills, and six VT4886 loudspeakers as front fills. The subwoofer deployment will include 12 flown JBL VTX S25 subwoofers with six per side, nine S25 subwoofers in a cardioid array, four S25 as side fills, and ten JBL VT4880A subwoofers as infra subs. Power will be provided by 29 Crown I-Tech 4X3500HD amplifiers and 10 Crown I-Tech 5000HD amplifiers. Radu credited the new high-frequency driver and waveguides as important factors in A12’s performance. He says that the off-axis response has been particularly striking. When you move to the side, the high frequencies don’t fall away as they do with other loudspeakers, even at 45 degrees off-axis. As a result, the stereo imaging is unusually vivid. But perhaps the characteristic that has most impressed Radu is the A12’s phase response. The A12 also features a completely redesigned rigging system that enabled Radu’s team to complete the installation with unprecedented speed and efficiency.